signed by the artist and TWO highly prominent Hell Hawks Pilots. As elements of the US VII Corps storm ashore on Utah beach below, P-47D Thunderbolts from the 365th Fighter Group, US Ninth Air Force - The Hell Hawks - overfly the Normandy bridgehead on the morning of D-Day, 6 June 1944. Flying from their base in southern England, the mighty Hell Hawks head inland to attack and successfully suppress German positions in support of the American advance. 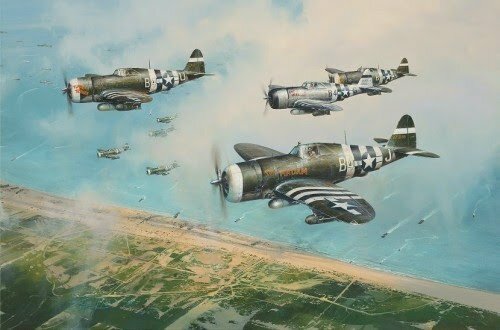 Continuing in his series of D-Day Anniversary editions spanning thirty years - D-Day Normandy Landings (40th), D-Day the Airborne Assault (50th), Doolittle's D-Day (60th), Robert Taylor has created a stunning masterpiece to commemorate the 70th Anniversary of one of the greatest Military operations in history.